Posted in: Uncategorized. Tagged: tvix, uvxy, VIX, VXX. There hasn’t been much volatility to speak of, but that could change, especially as we get closer to May and June. As the market’s best season (November-April) is nearing an end, I decided to get back to posting once or twice a week, and more frequently if we experience higher vol levels. There really hasn’t been much to write about this year, frankly, without any political nonsense, taper panic, or Eurozone defaults. Kind of boring, right? So there you have it. The April future moved up a measly 1%, and so did the VXX. 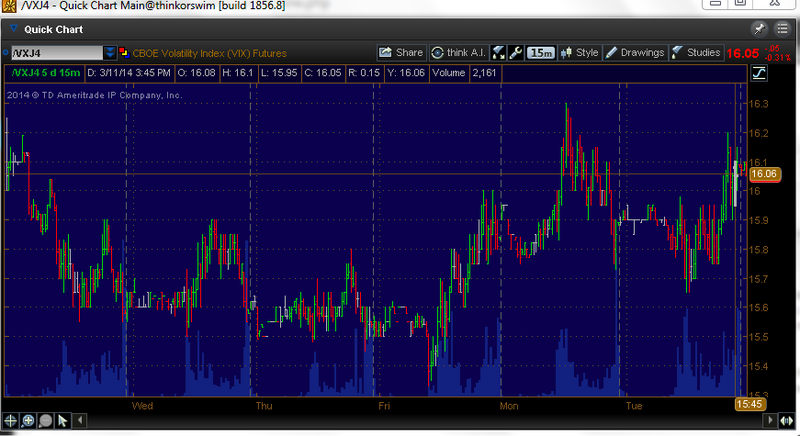 Now, if the market really cared about the sell-off today, the VIX would have broken 15 to the upside. Without any conviction from those buying S&P puts (the basis for the VIX calculation), then the futures market is not going to take notice, and still has a considerable buffer of 1.2 built in: VIX future of 16.05 less VIX of 14.80. There is no fear or protection being demanded at the moment. From an options perspective, there isn’t much to do in the VXX or UVXY. The future being 16 is too low to sell VXX calls and too high to sell VXX puts. We will sit and wait for a spike or a dip to get busy.